1. The speaker of each channel must be connected in strict accordance with the wiring diagram. If reverse the connection, will seriously reduce the sound effects. 2. The current ability of external power supply 5V port is within the limits of 100mA. Super-power use is strictly prohibited. 3. Increasing the power supply voltage appropriately and using relatively low impedance speakers, can be very effective to improve the output power. 4. We recommend for adequate power supply (the current must be large enough), otherwise, it cannot give play to the power of amplifier and speaker. 5. Although the product is a digital amplifier, there still will be heating phenomenon during the use, it is normal. 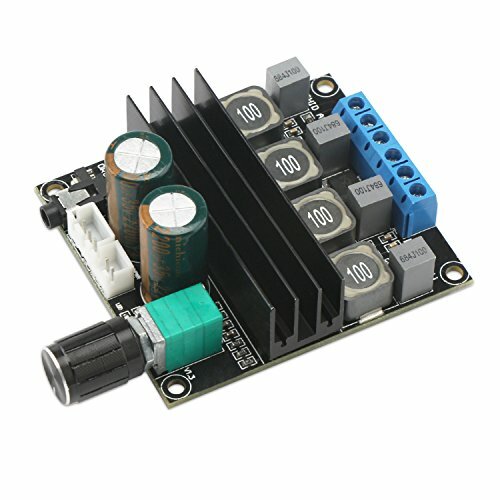 DROK digital amplifier board is operated by wide working voltage DC 10-25V with reverse connection protection. The power amplifier is made of high performance amplifier chip TDA3116D2, 2 channel stereo amplifier, 100W output power. The amp board is designed with a volume potentiometer, you can easily turn the voice high and down. 4-8 ohm speakers are highly recommended for this DROK digital amplifier. Note: to ensure this stereo amplifier work better, please add adequate power supply (the current must be large enough). If you have any questions about this product by DROK, contact us by completing and submitting the form below. If you are looking for a specif part number, please include it with your message.